An abridged version of this statement was also published in Annals of Internal Medicine: June 15, 2010, 152: 792-796. Objective: To provide health care providers, patients, and the general public with a responsible assessment of currently available data on prevention of Alzheimer's disease and cognitive decline. Participants: A non-Department of Health and Human Services, nonadvocate 15-member panel representing the fields of preventive medicine, geriatrics, internal medicine, neurology, neurological surgery, psychiatry, mental health, human nutrition, pharmacology, genetic medicine, nursing, health economics, health services research, and family caregiving, and a public representative. In addition, 20 experts from pertinent fields presented data to the panel and conference audience. Evidence: Presentations by experts and a systematic review of the literature prepared by the Duke University Evidence-based Practice Center, through the Agency for Healthcare Research and Quality. Scientific evidence was given precedence over anecdotal experience. 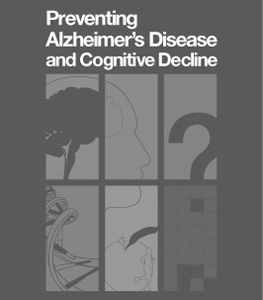 Conclusions: Cognitive decline and Alzheimer’s disease are major causes of morbidity and mortality worldwide and are substantially burdensome to the affected persons, their caregivers, and society in general. Extensive research over the past 20 years has provided important insights on the nature of Alzheimer’s disease and cognitive decline and the magnitude of the problem. Nevertheless, there remain important and formidable challenges in conducting research on these diseases, particularly in the area of prevention. Currently, firm conclusions cannot be drawn about the association of any modifiable risk factor with cognitive decline or Alzheimer’s disease. Highly reliable consensus-based diagnostic criteria for cognitive decline, mild cognitive impairment, and Alzheimer’s disease are lacking, and available criteria have not been uniformly applied. Evidence is insufficient to support the use of pharmaceutical agents or dietary supplements to prevent cognitive decline or Alzheimer’s disease. We recognize that a large amount of promising research is under way; these efforts need to be increased and added to by new understandings and innovations (as noted in our recommendations for future research). For example, ongoing studies including (but not limited to) studies on antihypertensive medications, omega-3 fatty acids, physical activity, and cognitive engagement may provide new insights into the prevention or delay of cognitive decline or Alzheimer’s disease. This important research needs to be supplemented by further studies. Large-scale population-based studies and RCTs are critically needed to investigate strategies to maintain cognitive function in individuals at risk for decline, to identify factors that may delay the onset of Alzheimer’s disease among persons at risk, and to identify factors that may slow the progression of Alzheimer’s disease among persons in whom the condition is already diagnosed. Alzheimer’s disease is the most common cause of dementia. It was first described in 1906 by German psychiatrist and neuropathologist Alois Alzheimer, who observed the pathological hallmarks of the disease—abnormal clumps of protein (beta-amyloid plaques) and tangled bundles of protein fibers (neurofibrillary tangles)—in the brain of a female patient who had experienced memory loss, language problems, and unpredictable behavior. An important breakthrough was the invention of the photomicrograph in the early 1900s by Solomon Carter Fuller, an African American psychiatrist; this key innovation provided a method for taking photographs through the lens of a microscope allowing visualization of amyloid plaques and neurofibrillary tangles. Since its first description, Alzheimer’s disease has gone from a rarely reported disorder to one of the most common disabling diseases among older adults. The increasing proportion of older adults in the U.S. population reinforces the urgent need for prevention and treatment of all chronic diseases including Alzheimer’s disease. In most individuals, cognitive health and performance remain stable over the lifetime, with only a gradual decline in short-term memory and processing speed. For others, however, the decline in cognitive function progresses to a more serious state of cognitive impairment or into various forms of dementia. Mild cognitive impairment is characterized by problems with memory, language, or other essential cognitive functions that are severe enough to be noticed by others and are reflected on cognitive tests, but are not severe enough to interfere with daily life. Dementia is characterized by progressive global deterioration of cognitive abilities in multiple domains including memory and at least one additional area—learning, orientation, language, comprehension, and judgment—severe enough to interfere with daily life. The diagnosis of Alzheimer’s disease is difficult and often imprecise, but its importance is without question. Depending on the diagnostic and pathologic criteria employed, Alzheimer’s disease accounts for 60 to 80 percent of all dementia cases. As many as 5.1 million Americans may currently have the disease, and the prevalence of mild cognitive impairment is even higher. Furthermore, the number of persons affected by Alzheimer’s disease or mild cognitive impairment is expected to increase considerably with the aging of the baby boomer generation. Alzheimer’s disease is the sixth leading cause of death in the United States and the fifth leading cause of death in Americans age 65 and older. Alzheimer’s disease and other dementias cost more than $148 billion in the United States annually, and these conditions also exact a substantial toll on patients and caregivers in terms of financial costs, stress, and anguish. To date, numerous studies have attempted to describe the etiology and factors associated with the risk for development and progression of mild cognitive impairment and Alzheimer’s disease, generating an abundance of theories on potential risk factors and therapies. Age is the strongest known risk factor for Alzheimer’s disease; most people with the late-onset form of the disease receive the diagnosis after age 60. An early-onset familial form also occurs, but it is rare. Genetic, cardiovascular, and lifestyle factors also have been implicated. What are the therapeutic and adverse effects of interventions to delay the onset of Alzheimer’s disease? Are there differences in outcomes among identifiable subgroups? If recommendations for interventions cannot be made currently, what studies need to be done to provide the quality and strength of evidence necessary to make such recommendations to individuals? At the conference, invited experts presented information relevant to these questions. A systematic evidence review, prepared under contract with the Agency for Healthcare Research and Quality (AHRQ) from the Evidence-based Practice Center (EPC) at Duke University’s Clinical Research Institute, was summarized (available at http://www.ahrq.gov/clinic/tp/alzcogtp.htm). It emphasized randomized controlled trials with health outcomes as their endpoints. Conference participants also provided oral and written comments in response to the conference questions, and the panel considered all of this evidence when preparing the consensus statement. The panel review included relevant studies on the relationship of multiple factors, including nutritional, medical, social, economic, behavioral, environmental, and genetic, with mild cognitive impairment or Alzheimer’s disease. The scope of the review was restricted to human studies conducted in developed countries with sample sizes of at least 50 participants for randomized controlled trials (RCTs) and 300 participants for observational studies and a minimum duration between exposure to preventive interventions and outcomes—to assess success of interventions of 1 year for studies of mild cognitive impairment and 2 years for studies of Alzheimer’s disease. The panel considered studies published in English that included participants 50 years or older, of both sexes, and of diverse racial and ethnic populations. Studies were rated by the EPC based on their quality by using the GRADE (Grading of Recommendations Assessment, Development, and Evaluation) criteria. The panel’s charge was confined to answer questions related to prevention and not treatment of established Alzheimer’s disease and cognitive decline. Currently, no evidence of even moderate scientific quality exists to support the association of any modifiable factor (such as nutritional supplements, herbal preparations, dietary factors, prescription or nonprescription drugs, social or economic factors, medical conditions, toxins, or environmental exposures) with reduced risk of Alzheimer’s disease. Genetic factors, particularly the apolipoprotein E (ApoE) gene variation, are associated with risk of Alzheimer’s disease. Although better understanding of genetic risk factors for Alzheimer’s disease may ultimately lead to effective therapies, the observed genetic associations are currently relevant largely as stratification factors in studies designed to identify additional risk factors and in clinical trials designed to test effectiveness of therapies. Numerous modifiable factors have been reported to show association with risk for Alzheimer’s disease across multiple studies, but the overall scientific quality of the evidence is low. Thus additional studies on these factors may change, perhaps substantially, the magnitude or direction of the observed associations. Chronic diseases and conditions such as diabetes, elevated blood cholesterol level in midlife, and depression have been associated with increased risk of Alzheimer’s disease. Several dietary and lifestyle factors and medications also have been linked to a decreased risk of Alzheimer’s disease; these include adequate folic acid intake, low saturated fat consumption, high fruit and vegetable consumption, use of statins, light to moderate alcohol consumption, educational attainment, cognitive engagement, and participation in physical activities. Current smoking, never having been married, and having low social support are all reported to be associated with increased risk of Alzheimer’s disease. However, the quality of evidence for the association of these factors with Alzheimer’s disease is low. No consistent associations were found for other vitamins; fatty acids; the metabolic syndrome; blood pressure; plasma homocysteine level; obesity and body mass index; antihypertensive medications; nonsteroidal anti-inflammatory drugs; gonadal steroids; or exposures to solvents, electromagnetic fields, lead, or aluminum. One of the challenges of interpreting findings of existing studies on risk factors for Alzheimer’s disease is the lack of a consistent and uniformly applied definition of Alzheimer’s disease. Another key challenge is distinguishing factors associated with Alzheimer’s disease from factors associated with other late-onset disorders that are prevalent in older adults. For example, vascular disease can lead to dementias, and because vascular disease is common in elderly persons, it often may be present in individuals with Alzheimer’s disease. Thus, it can be difficult to differentiate between factors associated with Alzheimer’s disease because of their contribution to vascular disease and related dementias and factors that are truly associated with Alzheimer’s disease. Similarly, it is unclear whether some of the observed associations, such as depression, might reflect early features of Alzheimer’s disease. The primary limitation of most of these studies is the distinction between association and causality. Diseases are complex; they are determined and shaped by many variables. Factors that are reproducibly associated with disease, even when they are not contributing causally, can still be useful as potential predictors of risk. But the primary reason that association studies are conducted is to identify factors that might actually contribute to risk of disease. A key problem with associations is that they often involve factors that are themselves correlated. For example, individuals with higher levels of education also are more likely to have higher levels of cognitive engagement. When a set of correlated factors shows an association with disease, it is difficult to determine whether any (or all) of the factors contributes causally to disease. Alternatively, one or more unobserved factors (correlated with the others) may actually account for the observed associations. Cognition is a combination of skills that include attention, learning, memory, language, visuospatial skills, and executive function, such as decisionmaking, goal setting, planning, and judgment. Decline in cognition ranges from severe dementia, such as Alzheimer’s disease, to mild cognitive impairment and age-related cognitive decline. Cognitive decline is multicausal, and mild cognitive impairment does not always progress to dementia. Neuropsychological testing for the above-mentioned skills over varying time periods has been the predominant method for the evaluation of cognitive change, but functional cognitive decline is only moderately associated with pathologic changes typical of Alzheimer’s disease. The idea of cognitive reserve (the mind’s resilience to neuropathologic damage of the brain) explains variances in ability to cope physiologically and mentally with existing pathology. Despite the hopeful insights provided by this concept, these issues complicate attempts to design robust studies to determine factors that might prevent cognitive decline. For most factors, existing studies either show no association with cognitive decline or provide inconclusive evidence. Where an association was seen, the overall quality of the evidence is low. Nutritional and Dietary Factors. The available evidence does not support a clear role for most of the nutritional and dietary factors that have been examined. The most consistent evidence is available for longer chain omega-3 fatty acids (often measured as fish consumption), with several longitudinal studies showing an association with reduced risk for cognitive decline. For the other factors, the evidence varies from no consistent association (vitamin B, vitamin E, vitamin C, folate, and beta-carotene) to very limited evidence suggesting a possible protective effect (low saturated fat and high vegetable intake). Medical Factors. Several cardiovascular risk factors have been consistently associated with increased risk for cognitive decline. High blood pressure has been most consistently associated with cognitive decline, and particularly with severe cognitive decline. Diabetes also has been associated with an increased risk for cognitive decline, but this association is modest and less consistent. The metabolic syndrome, a cluster of metabolic abnormalities, has been consistently associated with a modest risk for cognitive decline. For other medical factors, good-quality studies are lacking (for example, sleep apnea and traumatic brain injury) or findings have been inconclusive (for example, obesity). Psychological and Emotional Health. Depression and depressive symptoms have been consistently found to be associated with mild cognitive impairment and cognitive decline. Medications. No consistent epidemiologic evidence exists for an association with statins, antihypertensive medications, or anti-inflammatory drugs. Data are insufficient to comment on cholinesterase inhibitors or memantine. Existing reports are difficult to interpret because of variation in formulations, dosage, duration, route of administration (as for postmenopausal estrogens), and drug treatment effect (for example, antihypertensive medications). Socioeconomic Factors. Childhood socioeconomic status or cognitive milieu does not appear to strongly influence cognitive decline later in life. Evidence on the putative association between years of education and cognitive decline is inconsistent. Social and Cognitive Engagement. Whereas findings on the association of cognitive decline with living alone or being without a partner are inconsistent, a robust association exists between the loss of a spouse and cognitive decline. Limited but inconsistent evidence suggests that increased involvement in cognitive activities in later life may be associated with slower cognitive decline and lower risk for mild cognitive impairment. Physical Activity and Other Leisure Activities. Preliminary evidence suggests beneficial associations of physical activity and other leisure activities (such as club membership, religious services, painting, or gardening) with preservation of cognitive function. Tobacco and Alcohol Use. Evidence indicates that current smoking is associated with increased risk for cognitive decline; evidence for past smoking is less consistent. Findings on the association between cognitive decline and alcohol use are inconsistent. Genetic Factors. Most studies suggest that the ApoE gene variation is associated with an increased rate of cognitive decline in elderly persons, especially on some memory tasks and tasks of perceptual speed. The ApoE gene variation does not seem to affect all cognitive domains, and there is variability among studies. Much of the available evidence derives from studies that were originally designed and conducted to investigate other conditions, such as cardiovascular disease and cancer. Thus, evidence from studies conducted to date is limited by methodological issues in the assessment of the outcome (cognitive decline) or exposures (risk factors). Limitations in the evaluation of outcome include the lack of a clear definition of and standardization of criteria for cognitive decline (cognitive decline is not a single entity and may have different etiologies). Instruments used by different studies varied in their scope, making it difficult or impossible to compare results across studies and to identify the reasons for inconsistency in findings. The ascertainment of cognitive decline was often limited to a single measurement at follow-up. This approach severely limits the ability to determine validly whether cognitive decline really exists, especially because cognitive decline is not linear, many factors affect cognitive performance, and these factors may change in the same individual. Many studies were limited by the relatively short duration of follow-up. The studies also differ widely in the quality of the measurements of important exposures (for example, dietary factors, lifestyle habits, medications, health history, social factors, and engagement). Many of the available studies characterized their participants only at a single time point. Although numerous interventions have been suggested to delay Alzheimer’s disease, the evidence is inadequate to conclude that any are effective. Our conclusions are based on a review of published literature of adequately powered RCTs, the most rigorous, highest quality evidence. RCTs are studies in which participants are allocated by chance alone to receive one or more treatment interventions. Because of the protracted course of Alzheimer’s disease, our conclusions are based on RCTs that were at least 2 years in duration and adequately powered. Our conclusions do not reflect the existence of observational studies in which the investigator does not assign the exposure or treatment of interest to participants. However, information from these observational studies has formed, and will form, the basis for RCTs. Vitamins, Nutrients, and Dietary Supplements. A recent RCT of vitamin E found no evidence that this factor changed the onset of Alzheimer’s disease. Other nutritional factors (such as other vitamins or the Mediterranean diet) may be beneficial, but evidence to support this conclusion is insufficient. It has been suggested that patients with vitamin deficiency may demonstrate a greater response, but no trials have examined this issue. Gingko biloba was reported to have some benefit in small, short-term clinical trials. However, a recent, large long-term RCT comparing gingko biloba with placebo showed no reduction in the incidence of Alzheimer’s disease, leading to the conclusion that evidence is insufficient to support the efficacy of gingko biloba. Medications. Cholinesterase inhibitors are the most common treatment for mild to moderate Alzheimer’s disease and have been the focus of several RCTs evaluating prevention of Alzheimer’s disease. Although there is some inconsistency in the literature, the body of evidence led us to conclude that this class of drugs does not effectively prevent Alzheimer’s disease. Evidence from RCTs of antihypertensive medications and hormone replacement (conjugated equine estrogen) is also insufficient to indicate that these agents protect against Alzheimer’s disease. Some available evidence shows that certain medications may increase the incidence of Alzheimer’s disease. Two RCTs of specific nonsteroidal anti-inflammatory drugs—rofecoxib, naproxen, and celecoxib—suggested an increased incidence of Alzheimer’s disease with treatment. However, these studies were limited by high dropout rates and early termination because of concerns about toxicity. Two RCTs of conjugated equine estrogen, one combined with methylprogesterone, suggested an increased incidence of dementia (including Alzheimer’s disease) with treatment. These trials suggest that no known medication can be said to reliably delay the onset of Alzheimer’s disease. Other Factors. No RCTs were identified that evaluated the effects of cognitive engagement, physical activities, or other leisure activities for delaying the onset of Alzheimer’s disease. Several interventions have been evaluated with respect to improving cognitive function or preventing cognitive decline. Despite some encouraging associations found in observational studies, RCTs of specific interventions have not definitively established positive therapeutic effects on maintaining or improving cognitive function, or preventing cognitive decline. However, there also is little evidence to suggest that interventions designed to improve cognitive function either worsen it or produce unwanted side effects. In addition, no data are available from which to draw firm conclusions about differences in outcomes among identifiable subgroups. Some of the main reasons for the inability to identify successful interventions may include (1) lack of a validated and consistent definition of cognitive decline; (2) the small number of RCTs with cognitive decline as a primary outcome; (3) limitations of study design and analysis including short follow-up duration, biases and inconsistencies in study subject recruitment, small effect sizes, and confounding effects of multiple interrelated behaviors. Vitamins, Nutrients, and Dietary Supplements. Several RCTs did not find a role of vitamin supplementation in preventing cognitive decline. However, these trials used varying doses of the nutrients, did not uniformly measure and monitor patients’ cognitive function and baseline nutritional status, had short and variable follow-up, and mostly measured cognitive decline as a secondary or tertiary outcome. Thus these trials may have been underpowered. In a randomized trial complicated by poor adherence to therapy, gingko biloba co-administered with vitamin E did not improve or maintain cognitive function in elderly persons. A randomized trial of omega-3 fatty acids with only 26 weeks of follow-up found no effect on cognitive functioning. Other trials in progress may revise this evidence, but currently no interventional trials convincingly demonstrate that dietary supplements improve or maintain cognitive functioning. Medications. With the exception of a single trial of antihypertensive medication in patients with hypertension, known vascular disease, and history of stroke, all existing evidence suggests that antihypertensive treatment results in no cognitive benefit. Similarly, treatment with statins, low-dose aspirin, or celecoxib did not result in cognitive benefit, and naproxen was found to possibly increase cognitive decline. Randomized trials of estrogen have not shown any preventive effects on cognitive decline, and conjugated equine estrogen plus methylprogesterone may worsen cognitive outcome. However, trials examining the effect of gonadal steroids to date have had several shortcomings, including inconsistencies in types of steroid used, duration and timing of use, type of menopause (surgical or natural), and mode of delivery. Finally, multiple trials of cholinesterase inhibitors have shown no consistently positive effects on cognitive decline. Together, these data suggest that no currently available medications can prevent the onset of cognitive decline. Cognitive Engagement. A large randomized trial of cognitive training (consisting of memory, reasoning, and speed) over 5 to 6 weeks with a subsequent booster period showed modest benefits on cognitive functioning and a small, statistically significant effect on reducing the extent of age-related cognitive decline at 5-year follow-up. This trial also showed a very small significant benefit on instrumental activities of daily living—for example, managing finances, managing medications, and keeping house—and, in a subgroup analysis, benefit on driving performance in elderly persons. However, these findings need to be replicated to confirm the benefits of cognitive engagement on preventing cognitive decline over a longer period and in persons with varying levels of baseline cognitive abilities before firm recommendations can be made. The sustainability of these behaviors must also be assessed in large, community-based samples, in which other, less rigorous interventions showed no benefit. Physical Activity. Some evidence from small interventional studies and selected observational studies suggests that increased physical activity, including walking, may help maintain or improve cognitive function in normal adults. A meta-analysis of several RCTs, many with methodological limitations, concluded that data were insufficient to state that aerobic activity improves or maintains cognitive function. A small, higher quality randomized trial of physical activity in persons with confirmed memory problems showed modest benefit in reducing cognitive decline; however, these data should be viewed as preliminary. Work is ongoing to further investigate the benefits of physical activity. Inconsistent and varied assessments of “age-associated cognitive decline,” “mild cognitive impairment,” and “Alzheimer’s disease” in the literature prevent clear and concise answers to this question. Diabetes mellitus, ApoE gene variation, current smoking, and depression are associated with increased risk of Alzheimer’s disease and cognitive decline. Limited evidence indicates that estrogens and nonsteroidal anti-inflammatory drugs increase the risk of Alzheimer’s disease; no evidence exists that these medications increase risk for age-associated cognitive decline. There are no consistent findings of increased risk for Alzheimer’s disease and cognitive decline associated with obesity, hypertension, and blood homocysteine levels. Likewise, no decreased risk with cholinesterase inhibitors has been found. Cognitive engagement (indicated by literacy and social enrichment), physical activities in later life, and a diet low in saturated fat and high in vegetable intake were associated with decreased risk of Alzheimer’s disease and cognitive decline. Light to moderate alcohol intake is associated with reduced risk of Alzheimer’s disease, but findings for cognitive decline are inconsistent. No consistent association has been found between Alzheimer’s disease or cognitive decline and intake of gingko biloba, beta-carotene; flavonoids; multivitamins; and vitamins B12, C, and E.
Most studies conducted to date had limited data and the quality of evidence was generally low. In addition, the risk modification effect of reported associations was generally small to moderate for Alzheimer’s disease and small for cognitive decline. Rigorous consensus-based diagnostic criteria for Alzheimer’s disease should be improved and uniformly used across research studies. Research is critically required for identification of biomarkers associated with Alzheimer’s disease and for further development of brain imaging techniques such as magnetic resonance imaging and positron emission tomography scanning to pinpoint pathological changes specific to Alzheimer’s disease that could be assessed in vivo and serve as objective diagnostic criteria. Alzheimer’s disease is known to have a long latent period with hallmark pathological changes seen in the brain tissue of younger adults. Further research is required to understand and delineate the natural progression of Alzheimer’s disease, to relate progression to pathological signs and clinical symptoms, and to determine (for example) whether depression and cognitive impairment are risk factors for the development of Alzheimer’s disease or reflect early stages of the disease. An objective and consensus-based definition of mild cognitive impairment needs to be developed, including identification of the cognitive areas or domains of impairment, the recommended cognitive measures for assessment, and the degree of deviation from normal to meet diagnostic criteria. This consistency in definition and measurement is important to generate studies that can be pooled or compared to better assess risk factors and preventive strategies for cognitive decline and Alzheimer’s disease. We encourage the use of a standardized, well-validated, and culturally sensitive battery of outcome measures (for example, the NIH Toolbox) that can be used across research studies to assess relevant domains of cognitive functioning in a manner that is appropriate for the functional level of the population sample being studied (for example, cognitively normal, mild cognitive impairment) and is responsive to detecting changes in cognitive function over time; age- and gender-specific norms need to be established for comparison and objective assessment of disease severity. We recommend a comprehensive approach to outcomes assessment that accounts for the impact of cognitive decline on other domains of function and quality of life of both the affected person and his or her primary caregiver. The caregiver is a valuable source of information about the daily function of the elderly person with mild cognitive impairment or early Alzheimer’s disease, and observational studies and RCTs should collect data from caregivers in a systematic manner. Following the model of other chronic disease epidemiology, large-scale, long-term population-based studies using precise, well-validated exposure and outcome measures are required to generate strong evidence on biological, behavioral/lifestyle, dietary, socioeconomic, and clinical factors that may have protective or adverse effects on risk of cognitive decline or Alzheimer’s disease. Individuals in these studies should be followed from middle age into old age, with repeated measurements to take into account the duration and timing of exposures, as effects of various risk factors may be more acute and interventions more effective during critical windows of time throughout life. Furthermore, data from early life, either retrospective or prospective, are necessary to assess the importance of these influences on later cognitive outcomes. Existing cohorts from ongoing, large-scale, population-based studies—including longitudinal cohort studies of cardiovascular and noncardiovascular risk factors and outcomes, with rigorous, standardized measures of a wide range of exposures and longitudinal socioeconomic surveys that contain detailed health measures—should be explored for opportunities for timely, cost-effective analyses of the development of cognitive decline or Alzheimer’s disease, provided that these outcomes are validly measured. Any associations found could be further tested by RCTs or new observational studies as appropriate. RCTs or prospective cohort studies are urgently required to evaluate comprehensively promising preventive strategies suggested by previous studies, such as omega-3 fatty acids intake, physical exercise, and cognitive training and engagement. Studies should include women and men from socioeconomically and ethnically diverse populations to examine the incidence and prevalence of Alzheimer’s disease and cognitive decline in these groups. Based on the successes to date of the existing collaborative efforts, it is clear that a collaborative research infrastructure (at both the national and international level) will be critical in advancing our research goals. Research is necessary to identify specific population subgroups that may be at higher risk of developing cognitive impairment or Alzheimer’s disease, based on nonmodifiable factors such as age, ethnicity, or gene variation (for example, ApoE). Long-term studies on high-risk populations (particularly treatment-seeking individuals with symptoms of mild cognitive impairment) should be conducted to delineate risk factors for and natural progression to Alzheimer’s disease and to identify the long-term outcomes and factors associated with improvement, decline, and stabilization of cognitive function. Building on the existing research infrastructure, additional research resources and platforms that facilitate longitudinal long-term assessments of the risk of cognitive decline and the risk of progression from cognitive decline to Alzheimer’s disease need to be leveraged. For example, a large, multicenter Alzheimer’s disease registry, following the models of cancer, would greatly expand opportunities for research and surveillance. In addition, observational studies within large healthcare delivery systems with defined populations and well-developed electronic health records could serve as a cost-effective research platform for studies of cognitive decline and Alzheimer’s disease. A Web site should be established to continually update the American public in an ongoing way about preventive interventions for Alzheimer’s disease and cognitive decline with proven efficacy. Future research into the basic mechanisms of normal and pathological aging is critical to identify additional targets for prevention. Cognitive decline and Alzheimer’s disease are major causes of morbidity and mortality worldwide and are substantially burdensome to the affected persons, their caregivers, and society in general. Extensive research over the past 20 years has provided important insights on the nature of Alzheimer’s disease and cognitive decline and the magnitude of the problem. Nevertheless, there remain important and formidable challenges in conducting research on these diseases, particularly in the area of prevention. Currently, firm conclusions cannot be drawn about the association of any modifiable risk factor with cognitive decline or Alzheimer’s disease. Highly reliable consensus-based diagnostic criteria for cognitive decline, mild cognitive impairment, and Alzheimer’s disease are lacking, and available criteria have not been uniformly applied. Evidence is insufficient to support the use of pharmaceutical agents or dietary supplements to prevent cognitive decline or Alzheimer’s disease. We recognize that a large amount of promising research is under way; these efforts need to be increased and added to by new understandings and innovations (as noted in our recommendations for future research). Community Mental Health Council, Inc.
E. Sander Connolly, Jr., M.D. Evelyn C. Granieri, M.D., M.P.H., M.S.Ed. Steven Fox, M.D., M.P.H., S.M. Hugh C. Hendrie, M.B., Ch.B., D.Sc. Planning Committee members listed above provided their input at a meeting held August 19–21, 2008. The information provided here was accurate at the time of that meeting. *Dr. Nancy Andreasen stepped down as panel chair on January 20, 2010, due to a relationship that was unforeseen to be a possible conflict of interest; we thank her for her invaluable service in this process. NIH Consensus Statements, State-of-the-Science Statements, and related materials are available by visiting http://consensus.nih.gov; by calling toll free 1-888-644-2667; or by e-mailing consensus@mail.nih.gov. Or, written requests can be mailed to the NIH Consensus Development Program Information Center, P.O. Box 2577, Kensington, MD 20891. When ordering copies of this statement, please reference item number 2010-00034-STMT. The Evidence Report prepared for this conference through the Agency for Healthcare Research and Quality is available on the Web via http://www.ahrq.gov/clinic/tp/alzcogtp.htm. Printed copies may be ordered from the AHRQ Publications Clearinghouse by calling 1-800-358-9295. The NIH State-of-the-Science Conference: Preventing Alzheimer's Disease and Cognitive Decline was webcast live April 26–28, 2010. The webcast is archived and available for viewing free of charge at http://videocast.nih.gov.